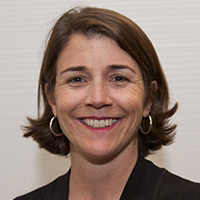 Caroline Cicero, PhD, MSW, MPL is an Associate Professor in the USC Leonard Davis School of Gerontology where she teaches graduate and undergraduate courses in policy and social sciences. Dr. Cicero is leading our Administration for Community Living (ACL) project focused on addressing barriers to access and use of home modification by identifying consumer needs as well as disseminating targeted information to underserved older adults and caregivers. She also serves as the Director of the USC AgeFriendly University Initiative, building a coalition of faculty, staff, students, alumni, and retirees to address the university’s built environment and experiences for older Trojans. Making local communities better places to grow old, fighting ageism in society and culture, and educating students to embrace aging and engage in policy change are her primary interests. As an interdisciplinary researcher, educator, policy advocate, practitioner, and community organizer, Dr. Cicero focuses on the intersection of individual and population aging; urban planning for lifelong communities; and social and health service delivery. Dr. Cicero is an active member of the Los Angeles Aging Advocacy Coalition, helping to build a policy agenda addressing the City’s 200,000+ low-income seniors at risk of homelessness. Her publications include book chapters in Long Term Care in an Aging Society; The Encyclopedia of Housing; The New Politics of Old Age Policy; Aging in America: Psychological, Physical, and Social Issues; and the Zoning and Planning Law Handbook in addition to articles in Public Policy and Aging Report; Aging Today; Generations; Journal of Aging, Humanities and the Arts; and The University of Illinois Elder Law Journal. For the last 27 years, Dr. Cicero has lived in the Los Angeles area, where her past professional work includes senior care management, affordable housing development, fall prevention, environmental design, and policy planning in public, private, and nonprofit settings.